"BUY COLLECTIBLE ITEMS FROM THIS DIVISION HERE!" 06/1943: SS-Panzer-Grenadier-Division 10 "Karl der Grosse"
Surrendered to the Russians in May 1945. Buy "Frundsberg" Cuff title here! At the end of March the divisional commander Heinz Harmel, was recalled from the front for hospital treatment in Berlin. Around this time Frundsberg was ordered to move to Dresden area, but while still en route was diverted back to the front to counter a Soviet breakthrough on the Oder front. Under 4. Panzerarmee of Army Group Centre, the remnants of the division were led by SS-Obersturmbannfuhrer Franz Roestel in the last few vain fights against the advancing Russians, but to no avail. They fell back to the Elbe, crossing near Dresden and heading south. After claiming a few Soviet T-34 tanks on 7 May the last few Panzers of the Frundsberg Division were destroyed by their own crews to avoid their capture to be used against them. The Frundsberg Division moved west to avoid capture by the Soviets, Some Frundsbergers managed to reach the relative safety of US Captors, the rest surrendered to the Red army at Teplitz-Schonau." The 10th SS Panzer Division Frundsberg earned the reputation as one of the best units of that Germany could muster during the Second World War. 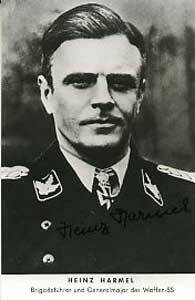 Thirteen Frundsbergers were awarded the Knights Cross, including Heinz Harmel. Old comrades to this day still meet regularly, and Heinz Harmel acted as a fatherly figure to each man of his unit to ensure their welfare until his death in 2000.